Many of the top track and field athletes in California are schedule to compete Saturday at the CA Winter Championships at Arcadia HS. 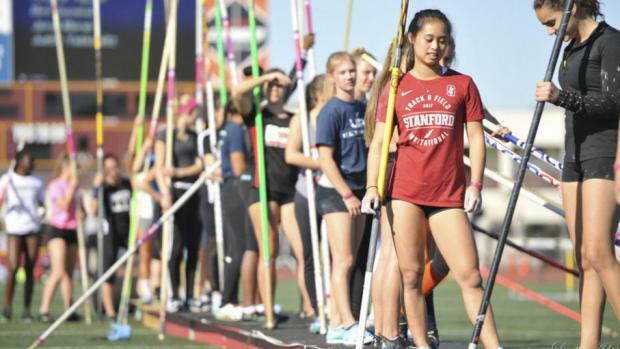 The list of top returners entered into the meet includes 2018 CIF-State Meet champions Laurel Wong (girls pole vault) and Daniel Viveros (boys shot put), as well as a strong group of the CA's elites. That list includes sprinter Jazmyne Frost, who helped lead Gardena Serra to the girls team title last June; Great Oak girls distance stars Tori Gaitan and Fatima Cortes (a double winner here last year); top boys sprinters, including Kenan Christon, Christopher Hill and Cristian Moore; Great Oak boys distance relays going after meet records, and State medal-winning girls throwers Faith Bender and Natalie Ramirez. 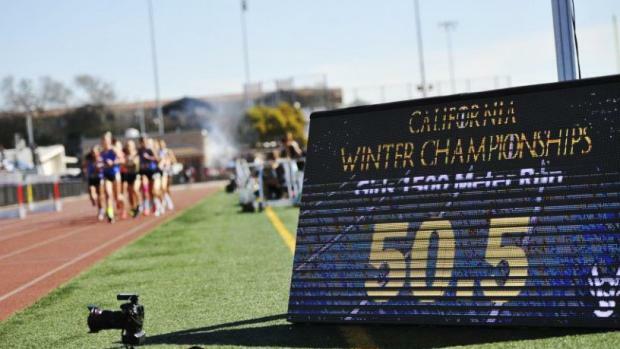 Saturday will be the fourth consecutive year the California Winter Championships will be held outdoors at Arcadia High following previous years indoors at Fresno State. The CA Winter Championships continues the tradition of the indoor meet allowing athletes to compete in indoor-length events, albeit outdoors. What follows on the next two pages are abbreviated versions of the 2018 results to include the winning mark and the top marks by non-seniors. Listed below are the event winners and the top five non-seniors in all events except boys field events where the results were reduced to the top three non-seniors. Relay championship teams and marks also are included. Grades listed are 2018. Now-graduated seniors are included if they were the 2018 event winners. The top mark over the previous three years -- the record for the event since the move outdoors -- is noted with the event header. Wong (in red at right) went on to win the State Meet title in the pole vault. In fact, the top three at the Winter Champs -- Wong, Amari Turner and Paige Sommers -- were the top three, in the same order, at the State finals. All three are entered into the 2019 Winter Championships in a deep girls pole vault field. Jackson, now at Cal, went on to place second in the triple jump and third in the long jump at State. Dyer was runner-up at State in the 100 hurdles and Fulton was runner-up in the triple jump. He didn't set a record but the winter boys shot put champion, Daniel Viveros, was also the State Meet champion. And, as with the girls pole vault, the boys shot put result at the Winter Championships proved to be an indicator for the State Meet with Viveros winning, Jeff Duensing placing second and a thrower from Great Oak third. That Wolfpack thrower was Jaime Navarro in the winter and Harrison Gould in the spring. Both Viveros and Duensing are entered for this year. Duensing's 59-11 qualifying best is tied for No. 14 in the U.S.
Like Viveros, De'Anna Nowling won the 60-meter dash at the Winter Championships and the 100-meter dash at the State Finals. She is not entered in an individual event in this year's meet but she is slotted as the anchor on a stacked team that could blow away the record in the sprint medley relay (100-100-200-400). While Nowling isn't among the entries in the open 60m, her chief rival in the sprints -- Jazmyne Frost -- is. At State, Frost was second in the 100, third in the 200, and was key on two strong relays while leading Gardena Serra to the team title. Kenan Christon, who was second in the boys 60-meters in the 2018 Winter Championships, went on to win medals in both the 100 and 200 at the State Meet. This USC football signee is one of the premier sprinters returning for 2019. Christon is entered into this year's meet. Grant Gaskins is one of the returners who competed in the high jump at last year's Winter Champions. But where Gaskins was most valuable for the Wolfpack last spring, was as the anchor of the State Meet championships 4x100 relay team. He's entered in the 60m and 300m sprints here. Josh Farmer, now at Colorado, won the pentathlon in the winter and went on to put up the third-highest decathlon point total in California history with his run-away victory at the Arcadia Multis. Farmer also went on to medal at State in the 300 hurdles. Boys Relays: Great Oak is stacking the DMR and 4x800 relays, undoubtedly with record times as the goal. The top Wolfpack DMR team is scheduled to line up as Chris Verdugo, Mateo Joseph, Ryan Shields and Tyler Tickner. Girls SMR: Calabasas has three teams entered into the Sprint Medley Relay, the best of which is scheduled to line up as Kennedy Waite, Bella Witt, Robinson-Hubbard and Nowling. All photos by Lizette Adams. Check out her photo gallery from the 2018 meet.